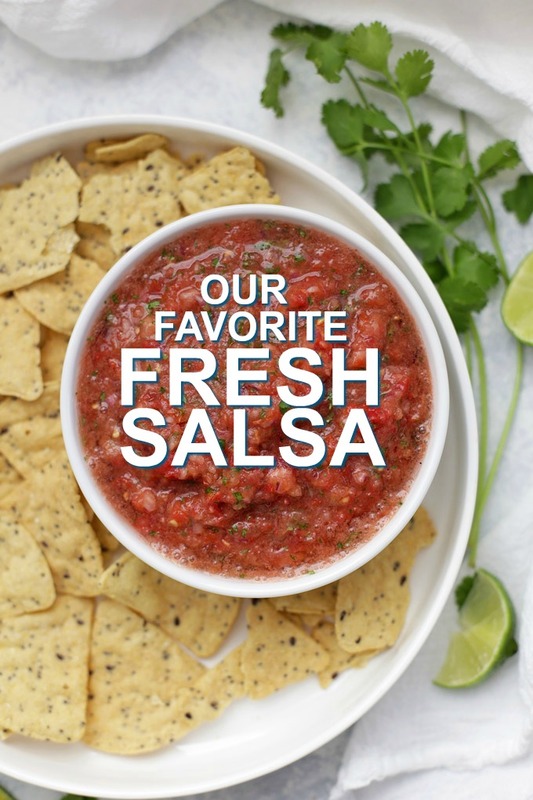 Our Favorite Fresh Salsa – Bright, fresh flavor and plenty of options for adding heat. 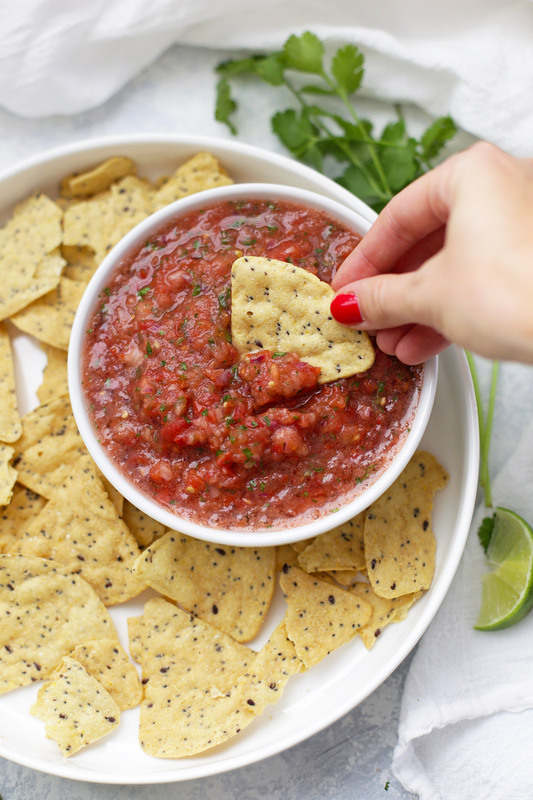 This salsa is good on EVERYTHING. Post, photos, and video updated April 2017. Original recipe posted summer 2015. We’re sooooo close to tomato season! 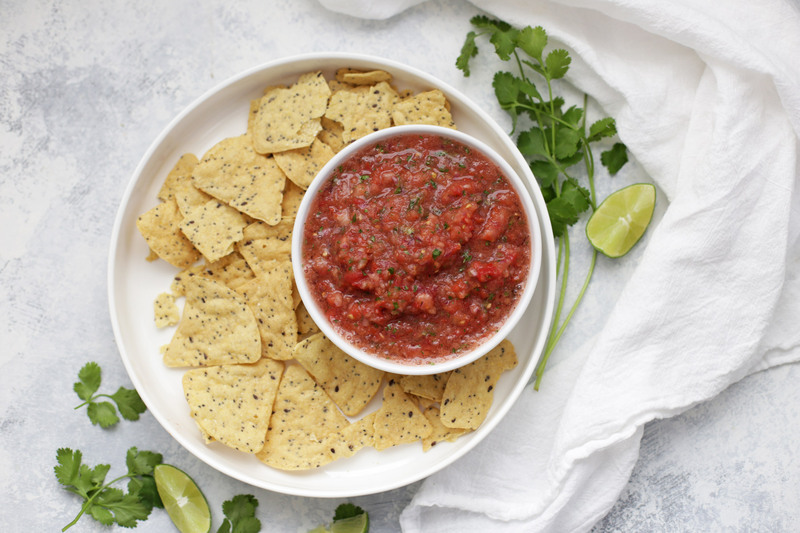 We’ve been dreaming of finding The Good Ones at the farmer’s market lately, and with Cinco de Mayo right around the corner, the craving has only gotten stronger! Sweet Suzy, do I love salsa. I’m great with any kind–chipotle, tomatillo, mango, peach, whatever! My kids (Sophie, mostly) are great with the smooth, mild stuff. That’s where this recipe for fresh salsa comes in. This is a mild, gentle, fresh introduction to salsa. 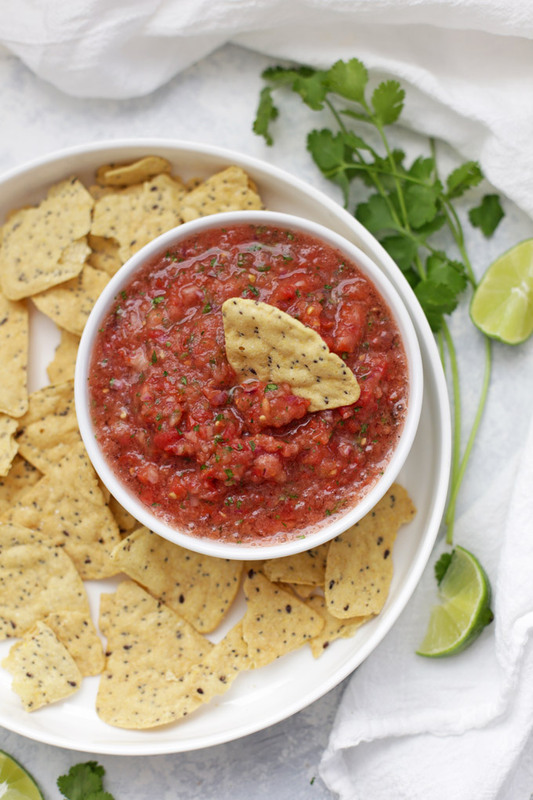 The fresh flavors taste like pico de gallo and the fairly smooth texture is great for kids (or adults!) who don’t like large pieces in their salsa. 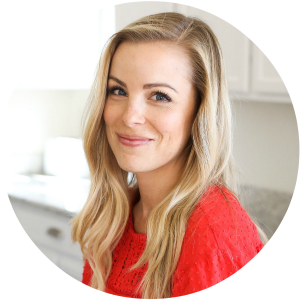 We put it on anything–taco salad, grilled chicken, chips, my morning eggs…I could go on. 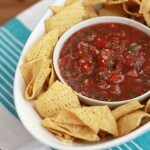 I think each salsa has its merits and this one has awesome fresh flavor rather than lots of heat. If you prefer a bit of kick, feel free to add some jalapeño, cumin, or even a tiny bit of chipotle in adobo, to taste. It’s delicious! Storing your salsa. 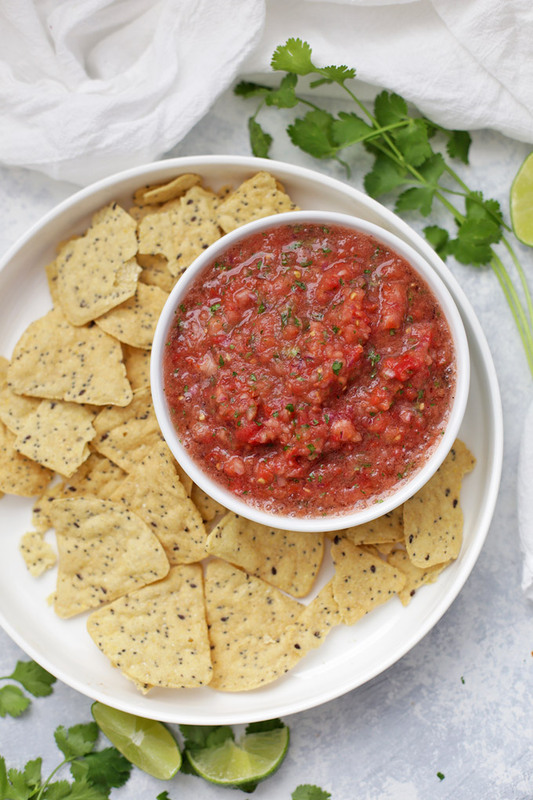 This fresh salsa will keep 5-7 days in the fridge, if you can stay out of it that long! I usually put it in a mason jar with one of these reusable lids (no rusty canning lids needed!) and it lasts really well that way. Kick it up a notch. Again, if you want a bit of kick, feel free to try adding a flavor booster–some fresh jalapeño, roasted green chiles, cumin, or chipotle chiles in adobo sauce. I ALWAYS recommend starting small and adding more as you go, since it’s a whole lot easier to ADD heat than it is to take it away. 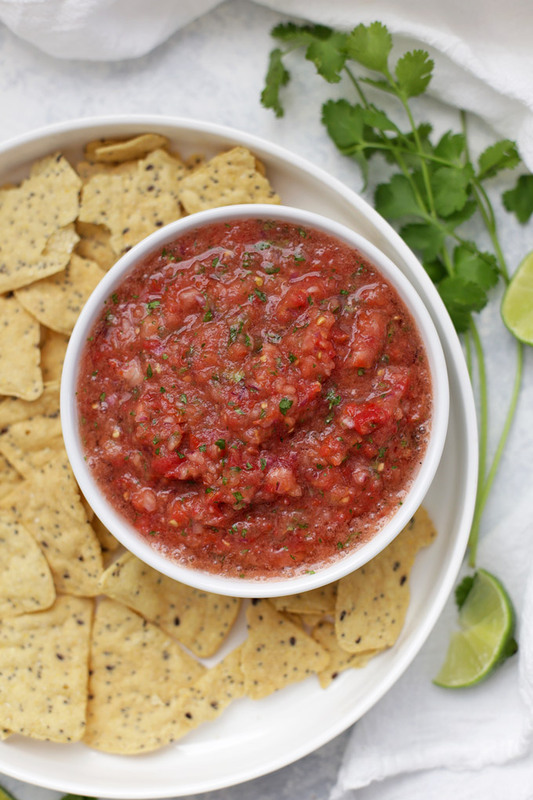 This is a fresh, mild salsa, and we usually skip anything spicy when making it. You can certainly add in a bit of jalapeño or green chile for some kick, if you like! Place all ingredients in a food processor or blender. Pulse a few times until you’ve reached your desired texture. Add salt, to taste. Yum!! I want to dive right in!! We are up north, so no tomatoes for us yet. I can’t wait though. Fresh tomatoes are the best!! There are some recipes that you just have to wait for the fresh tomatoes. This recipe will be added to the list for sure! Just made some. Delicious. I always have hand chopped and diced…first time to try a food processor (recently bought one) and wow so fast. No more chopping!!! I used green onions and it worked great. Thanks for your great recipes. Cynthia – I’m so glad you liked it. After trying it in the food processor, I’m never going back! So quick and easy!